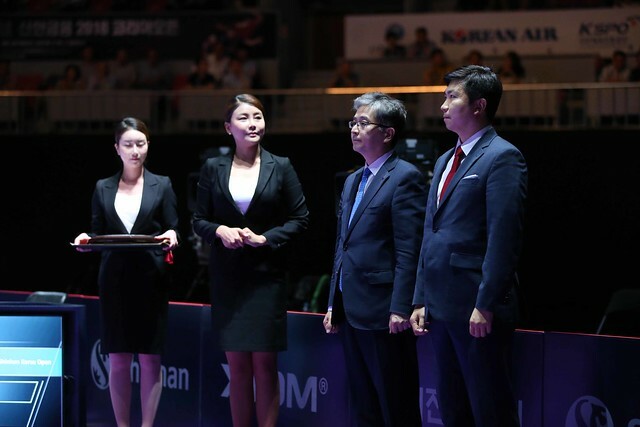 History making success the previous day in the Mixed Doubles event when partnering DPR Korea’s Cha Hyo Sim, Jang Woojin added to his collection at the Seamaster 2018 ITTF World Tour Platinum Shinhan Korea Open in Daejeon on the afternoon of Sunday 22nd July. He secured Men’s Doubles gold in partnership with colleague Lim Jonghoon; the no.6 seeds, at the final hurdle they beat Hong Kong’s Ho Kwan Kit and Wong Chun Ting, the top seeds (11-8, 19-17, 9-11, 11-9) to reserve the top step of the podium. Ready for the battle, Jang Woojin and Lim Jonghoon started matters the more positive pair, in the opening game they established a 5-1 before Ho Kwan Kit and Wong Chun Ting responded. The Hong Kong duo warmed to the task, they reduced the deficit to one point at 9-8, the stage at which the Korea Republic duo emerged successful in a stunning rally. The scintillating exchanges stemmed the recovery of Ho Kwan Kit and Wong Chun Ting. Excelling over the table from parity at 4-all, Ho Kwan Kit and Wong Chun Ting moved ahead 8-4 in the second game; Jang Woojin and Lim Jonghoon won the next three points, the Hong Kong duo called “Time Out”. Initially the break worked in favour of the Korean duo who, following another dramatic rally, established a 10-8 lead; Ho Kwan Kit and Wong Chun Ting levelled at 10-all, before eventually Jang Woojin and Lim Jonghoon secured the game 19-17 on their ninth game point, after taking a “Time Out” when leading 12-11 and then saving two game points. Two games to nil ahead, in the third Jang Woojin and Lim Jonghoon established a 9-6 lead but then suffered a bout of nerves as Ho Kwan Kit and Wong Chun Ting won the next five points to reduce the overall match deficit to one game. A lifeline for Ho Kwan Kit and Wong Chun Ting, in the fourth game time and again they held a one point lead but they were never able to build on the advantage, at 9-all it was parity; the next point went to Jang Woojin and Lim Jonghoon; in the second game they had needed nine attempts to convert, in the fourth they needed just one. The title belonged to the host nation; a career fifth ITTF World Tour Men’s Doubles title for Jang Woojin, a second for Lim Jonghoon, together they won in 2016 in Belarus.